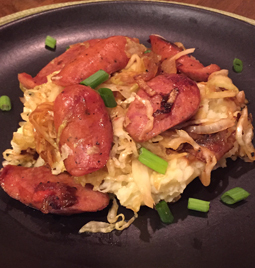 Mashed Potatoes with Sauerkraut and Sausage - A recipe from Savor California, the online showcase for extraordinary gourmet foods and beverages from California. Warm the sauerkraut in a small sauce pan. Saute the onion in olive oil until caramelized. Add garlic to pan. then ad a small amount of stock and simmer for a couple of minutes. Slice the sausage and sauté to heat. For each serving, top mashed potatoes with the sauerkraut, the onion-garlic mixture, and the sausage.